First and foremost, if you bring your child to an AntiGravity Kids class at Fighting Gravity Fitness they are guaranteed to have fun! Throughout the class each child will spin, swing, flip, and hang upside down. There will also be ten minutes where the student has free time and they can explore the hammock however they please. 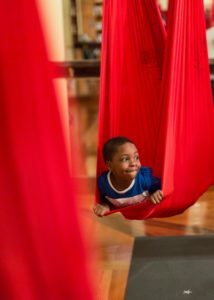 AntiGravity Kids classes have been through 4 years of piloting classes before the information was brought to the public. The instructor is a certified AntiGravity Kids Instructor who has previous experiences teaching and working with kids. These classes have been tested and designed to benefit the physical and mental aspects of each child who takes a class. Through enrolling your child in the AntiGravity Kids classes they will have fun while practicing presence, build self-confidence, empowerment, and they will increase their physical strength and body awareness. This class is designed to be upbeat and fun with opportunities for the students to be quiet and present in the hammock. The AntiGravity Kids classes are a place for children to slow down, separate from technology and our fast paced society and the kids can just play and breathe. Each AntiGravity Kids class begins by having the students swing. They fly on the hammock doing a pose that resembles a cannon ball into a pool. It is a great way to start off the class laughing and trying something completely new. The students spin, giggle and flip their way through a fun hour of class. There are two main opportunities for the student to practice presence in the class. During this time, children are encouraged to slow down their thoughts and focus on how they feel in the hammock in the present moment. The AntiGravity Kids classes provide children with brand new experiences. When the children have new accomplishments they will feel empowered when they see that they have conquered a brand new and different task. The children will also grow by trusting themselves to be able to accomplish the poses in the hammock. The students are also never pushed past their physical or mental limits. These classes focus on the process of completing a pose rather than the product. The student will accomplish as much of a pose as they can and they will be praised for their hard work and effort. The instructor will help the children to recognize that doing their best and working hard is more important than having a final product that was easy. This helps to instill a growth mindset in each student, which has a long list of benefits, particularly teaching children perseverance. Fighting Gravity Fitness’ kids classes will help foster a child’s independence because the students will be given help and support when they need it, but they will be encouraged to do as much as they can on their own, so they are given the opportunity to learn more about how their bodies move and develop their spatial awareness. The students will see what they accomplished on their own and they will feel proud of themselves. They will also grow to appreciate their bodies because they will see that their bodies helped them achieve. The last benefit of enrolling your child in the AntiGravity classes is that your child will become stronger and more aware of his or her body. The kids are constantly doing a variety of activities that causes them to use their upper body, core, and leg strength to maneuver in the hammocks. The students are pulling themselves into the hammock, flipping over, and pulling themselves out of poses that uses their upper body strength. The core strength is utilized in the flips as well as a variety of other exercises that help strengthen the child’s abdominal muscles. The students will work their lower bodies through jumping exercises and pushing off the ground to get into the hammocks. The kids will also become more flexible through these classes because the students use the hammocks to stretch in new and different ways. Lastly, each child will develop their proprioception, which will help them with balance and recognizing where their body is in space and time. Fighting Gravity Fitness offers our kids classes on Fridays at 1:00-2:00 for children who are four and a half through age six. On Sundays, we offer class for seven to ten year olds at 3:15- 4:15. During that time in our studio next door, studio B, we will offer a vin-yin yoga class for the children’s parents. So drop off your kids and take some time to yourself. It is our gift to you!